In Pre-columbian Mexico, Aztec masks followed a tradition of many cultures. The art form was ancient, and had religious connections. Masks were created in a variety of ways for a number of purposes, but there's one thing that may surprise you about a typical type of mask - they were often made for display, not to be worn. That's why you'll often see masks with no eye-holes, or masks placed on stone or on skulls. 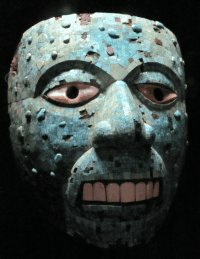 Masks used by the Mexica came from all over the empire. 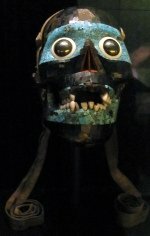 We know that, for example, a tribute including ten turquoise masks were sent to the Aztec capital from Oaxaca each year. Turquoise, a valuable non-transparent mineral, considered sacred, was often used in Aztec art. Sometimes masks were covered in mosaics made of various materials. The mask itself could be made of green or black stone, wood, obsidian (a hard dark volcanic glass/stone), or even placed on a real human skull. Common mosaic materials were turquoise, obsidian, gold pyrite, coral, and shell. Sometimes the mask would simply have inlaid teeth and eyes. To the right: Turquoise mosaic mask of the god Tezcatlipoca from the British Museum. The obsidian mirror symbolizes the god's supposed control of the hidden forces of creation and destruction. A human skull is the base of this mask. Ceramic masks were more rare, but they were made. The mask represented by the drawing above is ceramic. That mask is from Teotihuacán, and is believed to be a death mask. The eyes would have been filled in at one time. It may represent the god Xochipilli. See more examples of Aztec masks here. Aztec masks were used as ornaments, and were sometimes worn as part of a ritual, or in death as a death mask. They usually represented one god or another, and the Aztecs did have many gods. Like the artistry and materials, the Aztecs worshipped gods collected from a variety of cultures. A common type of mask would have snakes on it, a representation of the god Quetzalcoatl or perhaps Tlaloc. The masks generally then were used for worship of the gods, whether by being displayed in a temple or worn by a priest. A death mask usually had closed eyes and an open mouth. They were intended for nobles to wear after death, or displayed in memory of the deceased. Sometimes a warrior would actually literally remove the face of his victim from the battlefield as a mask. After the battle, the mask would be offered at the temple. Below is another mask made of stone. As you can see - probably a death mask, with closed eyes and an open mouth. In this case, the wearer of the mask would appear to be wearing the skin of a sacrificial victim (the mouth is a hole), something that was done by the priests (see another version of the mask here) when sacrificing someone to this god, Xipe Totec (the Flayed Lord). Notice the ear spools, commonly worn by Aztec people. More thoughts on the purposes of various masks here: Religious Aztec Masks.